Our first week and a half in Sicily has been one of ups and downs, mainly due to the weather which has veered from close to freezing point up to high 20s sunshine, with driving rains and gusty winds in between. Our moods have swung in tune with this in a week that’s seen us relaxing in shorts and t-shirts with meals outside one moment and taking retail therapy to get more winter clothing and comfort eating a bacon double cheeseburger with extra large fries the next. Darker early evenings have meant more time spent in a tiny van and have put pressure on our electrics – although the van has two batteries, one for “leisure” and one for starting, only the leisure battery is charged whilst we’re on mains power. Unfortunately, the interior lighting and the stereo all come off the van battery, so the jump leads have been pressed into use on a couple of mornings. Nonetheless, we have fallen for Sicily like we have for the rest of Italy. Following on from the southern mainland, Sicily is also run down and scruffy in places, but the charm and warm welcome we have received from its people have already touched us. We arrived at the port of Messina after a 20 minute, but €50 (one-way) crossing from Villa San Giovanni. We headed first for a campsite along the north coast which turned out to have closed early for winter but luckily managed to find one further along, past Milazzo. The weather was good the next day, so we decided to head south to see Mount Etna and had a wonderful drive on SS185 – a route that takes you over the mountains via a wonderful hill town Novara di Sicilia. These mountains were nothing as we rounded one bend and saw Etna lifting her snowy head above the clouds. 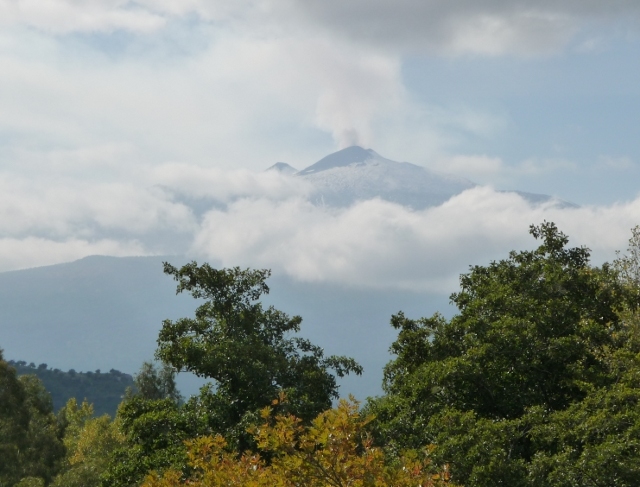 At 3300 metres high Etna dominates for many miles … that’s when she’s not totally shrouded in cloud. Our second night saw us at a quiet campsite, again by the sea, north of Taormina. This site was particularly blessed with the most adorable kittens and cat imaginable. 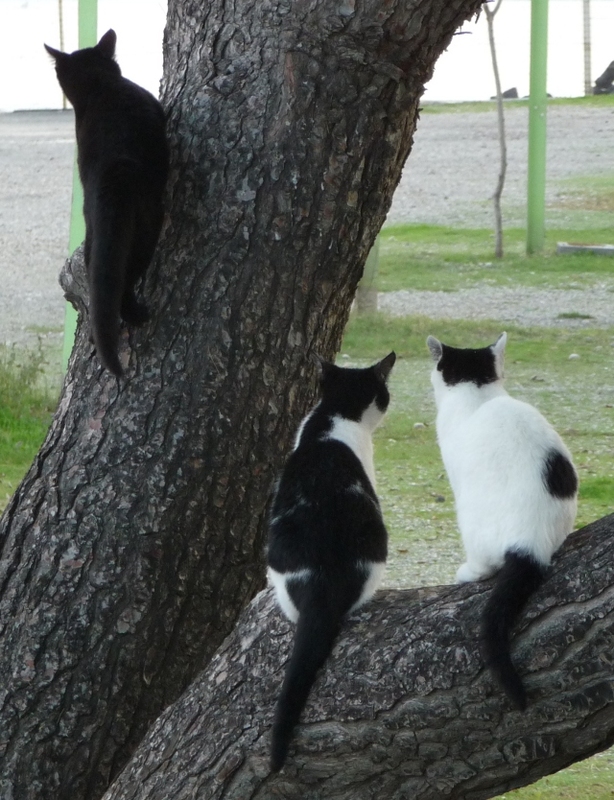 An overdose of cuteness, and Adrian named them Nero, Bianca and Arthur (halfer black and white), and old blue eyes Frank, a huge siamese cross, who did look quite fed up. We totally failed to find the fabled Greek amphitheatre at Taormina (Italian signage? ), and instead took a route round the northern edge of Etna. Etna is still an active volcano, its last major eruptions took place in the early 2000s, and it is surrounded by the barren landscape of huge lava flows along this route. 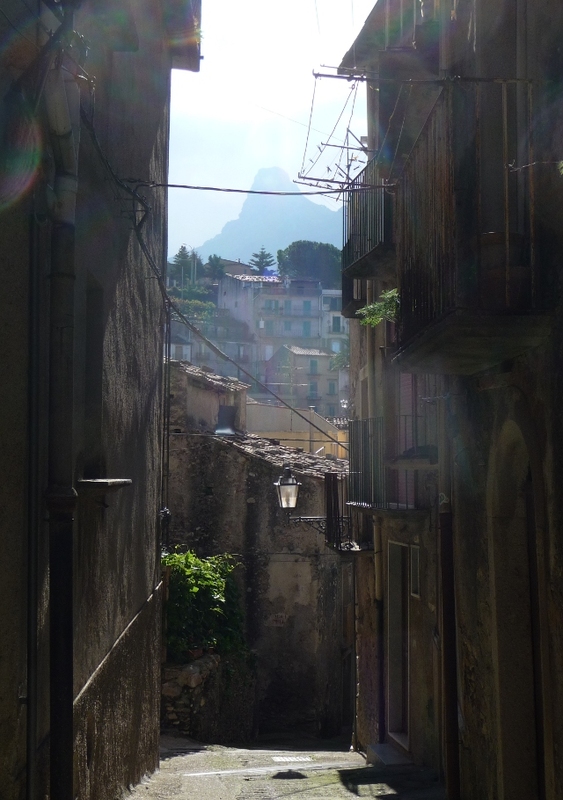 We stopped at Randazzo, a small town built from the dark volcanic rock. We caught the end of the Saturday market and found a busy pasticceria (patisserie or cake shop!). It was a step back in time and before we knew it we were walking out with a box full of cakes. These helped lift our spirits as the campsite near Nicolosi on the south side of Etna was deserted apart from a handyman, and was very chilly though the black-as-soot earth was striking. The start of around 24 hours of heavy rain kept us tucked up in the van with our high tea and DVDs. Next day we dashed through the continuing downpour to Nicolosi. The helpful chap in the tourist office didn’t hold out much hope for the weather for the rest of the week though, but gave us a number to ring to find out when it might be possible to get up to the volcano. We’re disappointed at being on Etna but not seeing it, and not knowing when we will be able to make the trip up to the crater. 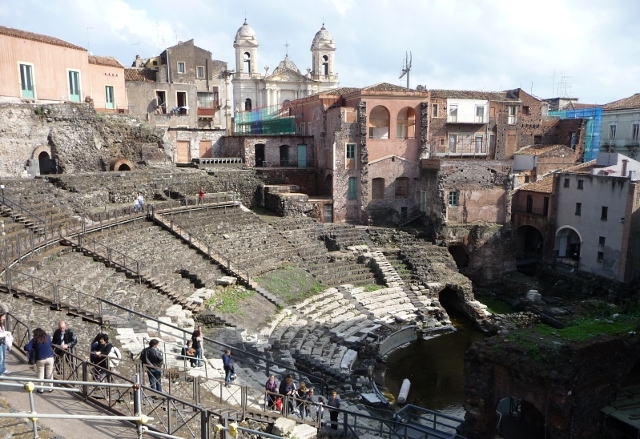 We’re lucky as we have the time and freedom to come back and try our luck again, unlike the poor people on the tour buses dragging through the teeming streets of Nicolosi. Instead, as mentioned above, we spent the rest of the day at a shopping centre. After stocking up on much needed clothing and shoes, as well as food and drink, we headed for yet another coastal campsite just north of Sicily’s second city of Catania. It was noisy, very noisy – the drama of waves crashing on the rocks below was deafeningly thrilling. We had just missed seeing our Costa Verde friends Neil and Jenny who had been here a couple of days before, but chatted to another English couple who had spent a couple of weeks there and not had brilliant weather, although they had managed a swim in the sea. 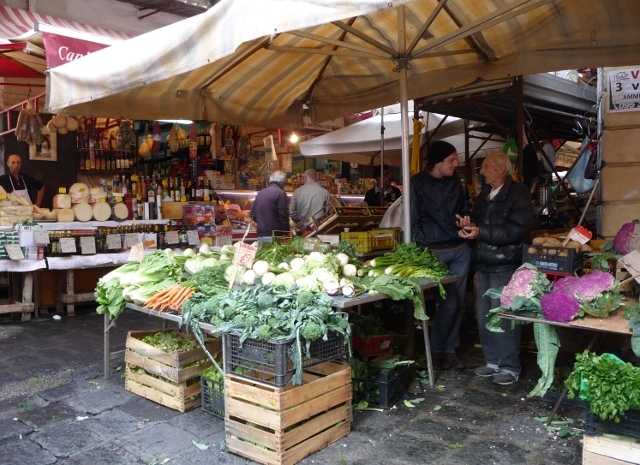 Not put off by tales of attempted bag snatches from fellow campers, we spent a day in Catania. It’s a faded grandeur city with a lively food market where we were at last able to stock up on much-missed fresh ginger. The seafood looked amazing, but we tried to avert our gaze from the whole sets of tripe/intestines hanging up on some of the meat counters. A lovely seafood lunch with squid ink spaghetti then grilled swordfish and frito misto followed our visit to the impressive ruins of the Greek amphitheatre here. You also got to see some of the houses from the 19th century that were built above it. Sicily was a major part of the Greek empire and these are likely to be only the first of many sites we’ll see. We were lucky with the weather and it was lovely and warm in the sun. Catania is supposed to be dominated by Etna which once destroyed it, but which remained once again elusive behind a bank of cloud. Getting a bus back to the campsite reminded us that it was All Souls Day – heavily celebrated here with visits to graves. It’s big business with a national holiday to help it along. Gigantic flower stalls are everywhere and buses are rerouted to run via the cemeteries. We washed the salt spray off the van before we left the campsite and headed down the coast towards another major but smaller city – Siracusa. Finding a prime parking space beside the bridge onto Ortigia, the island of the old town, we strolled across just as it started to spit yet again. Walking around this old city in pouring rain didn’t stop us falling in love with its honey Cotswold coloured stone and pink rendered buildings. Surrounded by water on almost all sides (and actually quite a few of the streets were almost submerged on the day we were there! ), there are narrow passages and hidden away squares, little gems of buildings everywhere. The cathedral is built into the remains of a Greek temple to Athena so has huge pillars down one side. We also saw the church of St Lucia, on the spot where she was martyred. There is a Caravaggio painting of her burial proudly on display here. After sheltering in a pizzeria for lunch, we decided to head to the nearest campsite. Another deserted site – an Agriturismo… a farm run site. We quickly dubbed it ‘Agriturismo wet field’ and ‘cold comfort farm’. It was neglected and overpriced. There was just one other encampment there – a local farmworker in a scruffy caravan whose dogs slept all night under our van out of the rain. We watched yet more DVDs and tried to plug the various leaks from the tailgate and keep our bedding dry. It was like so many wet 2cv camps in the UK, but without the high spirits. Just us all alone! First thing next morning we awoke to a brighter day and gunfire. Lots of gunfire really rather close by. 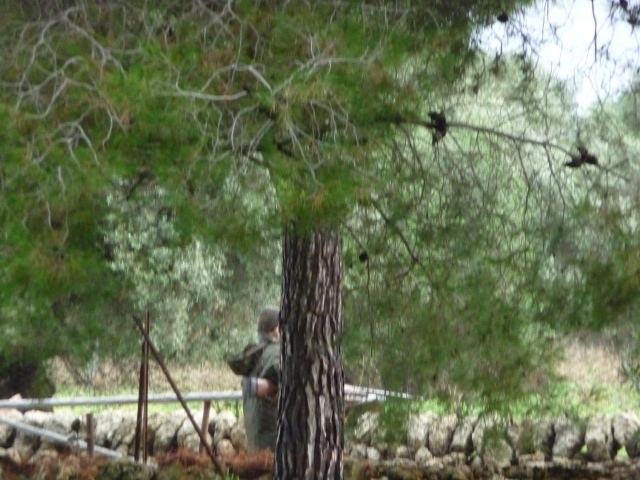 A chap was sitting on the stone wall of our field shooting. Vermin presumably. Luckily he was pointing his gun the other way. We were sorry to leave Siracusa before we’d seen all there was to see, more Greek sites, and some rather tempting flat rentals. After our rather odd campsite and the bad weather, we just wanted out of the area for now. We decided to aim for Scarabeo, a site with a healthy ACSI card discount. We knew it was good as Neil and Jenny were there already! On the way we visited some of Sicily’s Baroque towns. Because much of this south-east area was destroyed by an earthquake in the 17th century, towns were rebuilt around the time that Baroque style was all the rage. 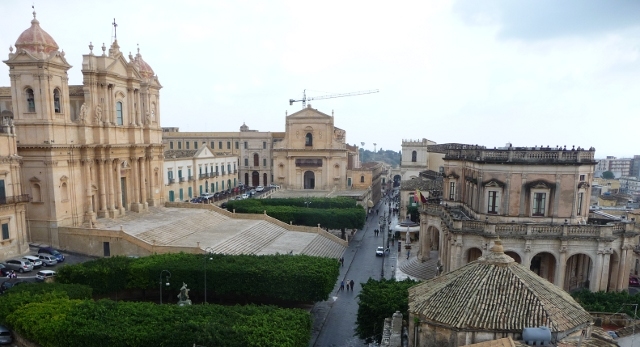 Noto is a small town with very grand buildings indeed. Several palaces and a huge duomo all in the honey coloured stone of the area. The dome is new though, the old one collapsed back in the 1990s. We climbed the bell tower of another church and generally enjoyed a pleasant wander round before moving on. We visited Modica, although we’d sadly just missed its chocolate festival, we found a shop with tastings. The chocolate here is different, it is top quality but is made without cocoa butter so has a particularly crumbly grainy texture. Modica has some lovely buildings and we ate our late lunch at a panoramic viewpoint on the opposite hillside, amused by the antics of a lovely Boxer dog. His owner was keen to demonstrate how well trained the dog was, but the dog preferred the smell of our lunch. The landscape around here is reminiscent of Derbyshire, rolling hills with a few cliffs and lots of dry stone walls. 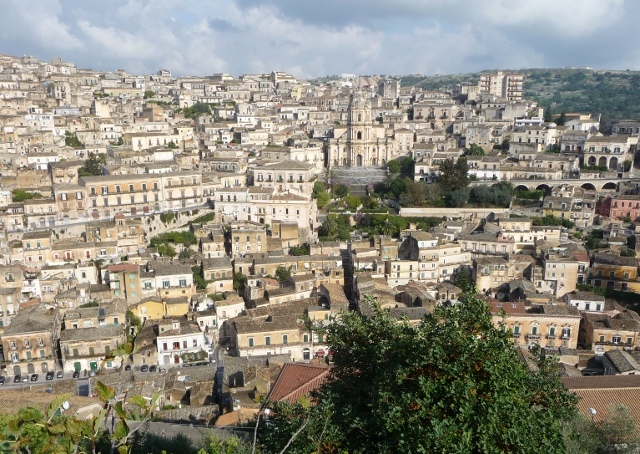 We drove on to Ragusa, another dramatically set Baroque town. Time was drawing on though and we decided to delay exploring, and head to our campsite on the coast before dark. We had a warm welcome from the friendly female owners of the site. It is a fabulous place, another lovely beach, and you get your own loo! It was also great to catch up with Neil and Jenny again. Although it had been less than a week since we last saw them, it felt a lot longer. This entry was posted in By Country - Italy, Food stuff, Personal stuff, Travel stuff, Van stuff, Wildlife stuff. Bookmark the permalink.